I used to be a ghostwriter. Between 2011 and 2014, I wrote countless articles for the great and good of the healthcare sector, from dentists and dental nurses to practice managers, associates and business professionals. While the concept of the ghostwriter may seem a fairly innocuous profession, most people won’t realise just how common it is across print and online media, and just how problematic it can be. As a professional ghostwriter with the nominal job title of ‘senior writer / journalist’, I’d have roughly a dozen clients to produce work for each month, from international corporations to manufacturers, online retailers, wholesalers, and individual dentists looking to raise their profile. Business areas could include anything from legal and finance to digital imaging, implants, orthodontics, practice management and infection control. The sheer breadth of clients meant that I very quickly became familiar with just about every aspect of the dental sector, and could turn my hand to writing anything from medical case studies to opinion pieces, advertorials, advice columns and adverts. I also later became familiar elements of general medical practice (i.e. doctors’ surgeries), and CQC compliance. While in theory my role was to work with clients to produce copy and come up with ideas, more often than not I’d have little to no information to go on, meaning that I was often the source of the content, with many clients merely giving an ‘ok’, or applying minor corrections to my copy before publication. Of course this wasn’t always the case, and some clients were an absolute pleasure to work with, but I’d estimate at least 50% of all content produced by me over a three year period was solely sourced by myself, and whatever I could come up with. I am not an expert in most of the areas I was writing about, and yet I was telling medical professionals how to do their job based on internet research. I am not a medical professional or qualified trainer, yet I was writing CPD articles for medical professionals. Many individuals I used to work for claim my work as their own, citing my articles on their LinkedIn profiles, and therefore using my work as a means to improve their own careers. As a ghostwriter I received zero credit or recognition for any work that I produced. While some may argue this goes with the territory, the nature of the deception is quite different when one considers that my work had a direct influence on the habits, decisions and purchases made by medical practitioners. Just whose opinions are they anyway? As a ghostwriter, more often than not the work I produced helped shape debates within the dental and medical professions. I remember one conference in particular where the opening talk drew attention to a piece that had been published in one of the major dental publications that I had in fact authored! 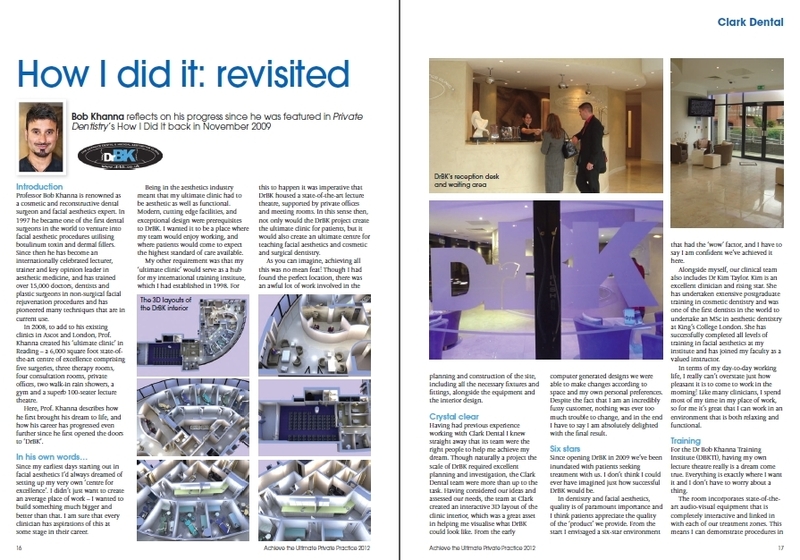 In this case I had at least interviewed the client in question, so it wasn’t all my own work, but the fact that the paper I’d written was lauded as an example of the culture shift in dentistry was something that really struck home with me. I mean, the person I interviewed just gave me some thoughts and I turned it into words and ‘filled in the gaps’. At what point does his work become my own? Why was I not getting recognised for the influence I was exerting across the sector? While some readers may find it disturbing to think that I helped shape debates within the dental sector, it is nothing compared to some of the dubious dealings I had, or was witness to, during the course of my time as a ghostwriter. Take medical case studies for example. Often I’d arrange a telephone interview with a dentist and take down detailed notes on the procedure to write up and email back to them for approval. However, in some cases I’d be lucky to get more than five minutes on the phone with the dentist in question. There was one particular case I remember in which an eminent implantologist emailed me the sum total of 18 words to work with! But it gets worse than that. In an even more shocking example, I once discovered a document in our office (thankfully produced before my time) that had been published using the name of one of our former employees on the cover. This employee had a PhD, so her name was on the cover as ‘Dr [NAME] PhD’. This document, a booklet on dental anaesthetics, served to promote the products of one of our clients based on the analysis of the ‘expert’ author. While the author certainly did have a PhD, it wasn’t in anything relating to medicine or dentistry – it was in classics! Looking back, it’s surprising to think just how much material published in the dental sector was produced either by the company I worked for, or by one of our competitors. There was even one issue of a publication (I think it was The Dentist) that I used to refer to as ‘my’ issue, as it included a range of articles by different ‘authors’, each of which was in actual fact written by me! But of course, I never got any credit for any of this. In fact I could walk around a dental conference tomorrow and few if any people would recognise me. I certainly didn’t get paid sufficiently for the valuable work I was doing. I even wrote a book for one of our clients. And yet the market was absolutely flooded with money. At any one point the company I worked for had over 40 clients, each paying thousands of pounds for our services, and tens of thousands of pounds in advertising to ‘persuade’ the publications to also include their bespoke articles that also helped to subtly promote their work and expertise. While most people probably realise that the articles they read may not be written by the person they think, I don’t believe people truly understand what it means, or even the extent to which it takes place. While I don’t have a problem with the concept of ghostwriting per se, I do think it is an issue when it comes to the dental and medical sectors, and in cases where the reader is being wilfully deceived, or where the ghostwriter isn’t suitably compensated for their efforts which often result in the ‘author’ receiving a lot of credit (and even money) for work that is not their own. At the very least I would like to see more publishers adopt a voluntary code of conduct so that readers are made aware that not everything they read is quite what it seems. Without raising awareness, things will just continue as they always have done, and people will continue to be deceived and important decisions made based on false premises.